Coworking at Home - Kellbot! | Kellbot! Earlier this month I found myself going stir-crazy being at home by myself all the time. Anyone who works in an office might thing I’m crazy – a space all to yourself away from your irritating coworker sounds amazing! But freelancers and other solo business owners know what I’m talking about. I looked into the various coworking spaces in the area, and found them to all be a bit more than I was willing to spend or a bit farther than I was willing to travel. Instead, I reorganized my office out of the living room and into the spare bedroom. Now in order to work, I have to leave my toys, and when I’m downstairs relaxing I can’t be trying to sneak work in. Being able to work from the couch, or bed, or hammock, is one of the perks of being self-employed. And while it’s great for a change of scenery, it’s not the most productive setting for most people. You probably already have a desk, but official canadian pharmacy make sure your guest coworker has a chair and a table on which to work. Your coworker should not have to fight for space. No one wants to work on the corner of your dining room table, sandwiched between your to-be-filed bills and that box of Christmas ornaments you keep forgetting to put away. 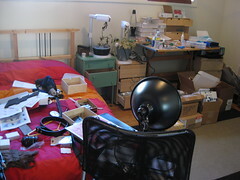 Find a space you can clear off, where your friend can work comfortably without feeling cluttered. They should have enough room for their laptop and a mouse, and maybe even a real monitor if they so desire. Keeping some snacks and drinks on hand will reduce the temptation to go out for food, something companies like Google figured out long ago. Carrots, grapes, rice cakes, yogurt, and trail mix are all good to have around. Messy snacks like cheetos, oranges, and other things likely to get on your hands are less ideal. If you do decide to stock the fridge with snacks to share, let your friend know where they are, along with cups/plates, so they don’t have to bug you every time they want a glass of water. If you’re working with a good friend, it’s tempting to socialize instead of work. A few quick conversations is fine, but you really should let each other get things done. If the temptation to gossip is too strong, consider setting up your work stations so you don’t face each other. Don’t let your friend be an enabler to bad work habits. And yes, working all night long is a bad habit. Your life needs some balance. Pick a time for your work day to end, at which point both of you should leave your office (or convert it back to the living room it was before). If you want to go out later for drinks or whatnot, letting your guest go home to have dinner, do a load of laundry, etc will keep their day from feeling super long. It’s nice to see that your DIY Aeroponics units are still in use. I hope we’ll hear more of that soon – I’m planning to build my own units (which will, out of necessity, include some rudimentary temperature control as well).